On Monday, I decided to take my new bread machine for a spin and see what it can do when it bakes a loaf directly in the machine. Since it was a test drive, I used the most basic white bread recipe in the book that came with the machine. 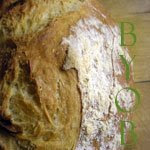 This wasn't a fancy bread--water, flour, sugar, dry milk, salt, butter, and yeast. It's the type of bread you use for peanut butter and jelly. Or grilled cheese. Or anything kid-oriented. I was happy with how the bread came out. I like that this machine bakes "sandwich loaves" that are horizontal, versus the tall vertical ones my last machine made. One side was higher than the other. I guess the two-paddle system doesn't always result in even loaves. It also took a lot of shaking to get the bread to release--and one paddle came with it. That's okay, though. It wasn't a big deal. Overall, the bread was everything you would expect a good white bread to be. Fine-grained and chewy. A good canvas for peanut butter and jelly. It will probably be made again and again in our house, since peanut butter and jelly sandwiches are a staple here. Not bad for a Monday morning--tossing ingredients into the machine as the kids eat breakfast. As usual, the best thing about making bread in the machine is how well it fits into our family's busy schedule.